Stimulating creativity and imagination today to develop the innovators of tomorrow. music, dance, painting, and theater are all keys that unlock profound human understanding and accomplishment." Unfortunately, since William Bennett, the former Secretary of Education, declared that the arts were an essential element of education many schools cut their arts programs. At St. Mary of the Assumption, the arts are alive and well. In addition to receiving weekly instruction in music and art, St. Mary's students also have the opportunity to participate in the clubs below. These experiences not only stimulate creativity, but also inspire learning, discovery, and achievement. Art Club is an activity for those students who just don’t get enough art during their one class each week! It is open to students in grades four and up. There are fun and messy projects for the students who like creating crafts, and there are more intense exercises for students who want to improve their drawing skills. ​There will also be occasions that Art Club members will work on group projects for the school, like bulletin boards. Art Club is an opportunity for the creative student to make more art, in an easygoing environment, without the time restraints of class. Face mosaics created by students in St. Mary's art program. Instrumental music lessons on woodwind and brass instruments are available for all students in grades 4-8. Classes are held during regular school hours. This is an excellent opportunity to provide your child with a unique learning experience in the arts. ​Band students receive a twenty-five minute small group lesson once a week during the school day. A special rotating schedule is used so that lessons do not interfere with the students’ academic performance. Lesson material includes learning to read music, all aspects of playing the instrument, and instrument maintenance. Students will be allowed to progress at their own rates in a positive learning environment. On the same day as a small group lessons, the students may also meet with the whole band where they learn to follow a conductor and perform as a group. This group band rehearsal is usually scheduled during noon recess. 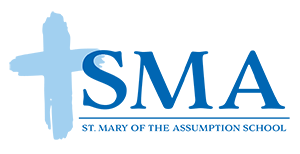 Parents receive three (3) written evaluations of their child’s progress, which will correspond with the first, second, and fourth grading periods. 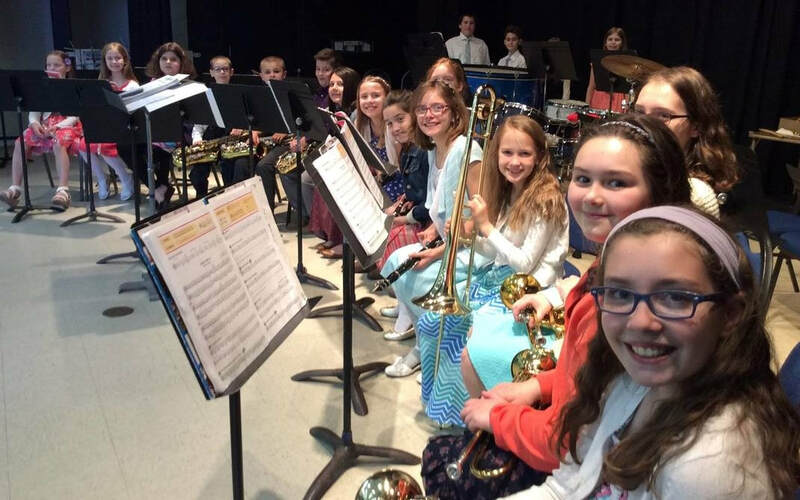 The students will have the opportunity to perform solos, in small ensembles, and group band selections during the Christmas and spring concerts. In addition, advanced students in grades 7 and 8 may participate in the OMEA Solo & Ensemble Contest. The advanced band delivers another crowd pleasing performance. In drama club, students get a chance to experience many parts of the theater world, from designing and building sets and props to learning stage makeup techniques. 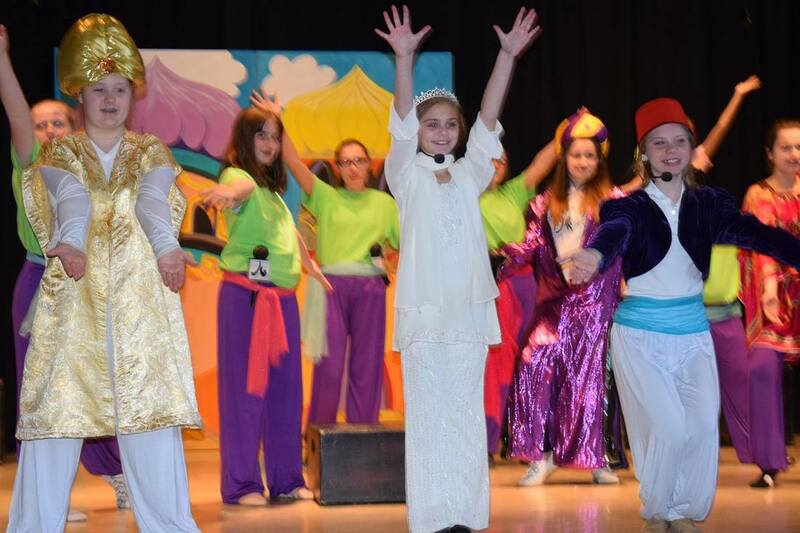 Students audition for the Jr. High production, which is a spring musical. Members of the cast and crew participate in after school rehearsals during January, February, and March to prepare for the production. Aladdin on stage in the Weaver Center. 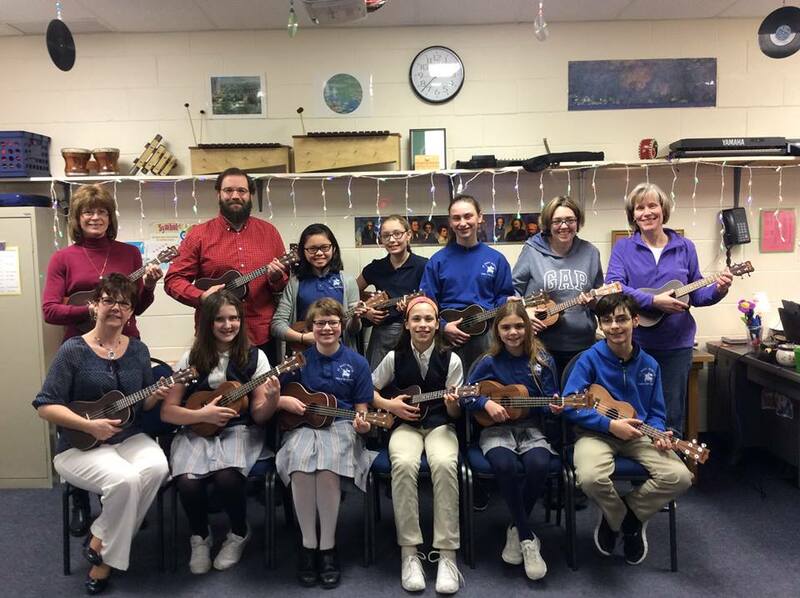 Established in 2016, the Ukulele Club is made up of students and teachers. The club is open to junior high students who want the opportunity to play ukuleles, learn some new songs and have fun! Meetings typically take place after school. In addition to after school practices, the club also offers opportunities to perform at school and parish events. In the past, the Ukulele Club has performed at masses, the grade 3-5 spring show, and with American musician, entertainer, singer-songwriter, and storyteller Tom Chapin. Any student who plays or wants to learn to play is welcome. No prior ukulele experience is necessary. The first meeting of the Ukulele Club in 2016. Members of the youth choir, The Grace Notes, praise God with their voices, using the talents God gave them. Along with improving their vocal skills, participation in choir can help your child develop responsibility, leadership skills and respect for others. Students will also learn about the format of the mass itself. Everyone who is in the Youth Choir is a member of The Grace Notes. However, older students in 5th grade or above may also be members of The Cantor Choir. Interested students will have to audition for this group. The Youth Choir will rehearse two to three times a month on Thursdays and will sing for one mass a month on the weekend. As the choir improves and the year progresses, the choir may sing for two weekend masses a month. The youth choir has also performed the national anthem at Captains Stadium and Christmas Carols at Playhouse Square. The Grace Notes Choir performs at Playhouse Square during the holidays.